Red hair gives any woman (plastic, real or real with plastic enhancements) a star. For just being drop dead gorgeous, having a nice rack, and extruding raw sexuality I give her a 2nd star. For making me not feel self conscious about my obesity and hairy body I give her a 3rd star. But there are drawbacks. She is no where nearly as pose-able as I would have liked and was therefore pretty limited in what I could do with her. Also, although it is red, her hair is made of some funky material that is hard to braid, put up into a bun or just plain manage at all. 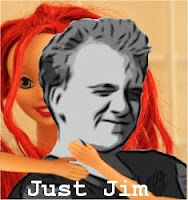 So for those two short-comings, the “Shower Time With Jim” Barbie only scores 3 stars. BARBIE IS A REGISTERED TRADEMARK OF MATTEL INC. Mattel does not endorse, support and hopefully doesn’t even know about Review-Spew.com. “Shower Time With Jim” Barbie is not an actual product of Mattel Inc. The pictures herein were produced and used without permission of Mattel Inc. All models depicted herein are over the simulated age of 18. The management of Review-Spew.com does not condone the grooming and abuse of Barbie Dolls or any Mattel product. All consent and release forms have been signed and are on file with the management of Review-Spew.com. Shower responsibly. “Shower Time With Jim” Barbie is now fully clothed and residing in her house in Malibu. She’s recovering quickly from her ordeal. Wow a whole other side of you i've never fully understood. Still don't understand but the visuals given were great! UR - thank you, I aim for twisted / not nice / but funny. Ryan - The photoshoot was the best part, until my 6 year old daughter caught me, fully dressed in the shower with the camera and her Barbie Doll: "Daddy, what are you doing???" That was a little...awkward.